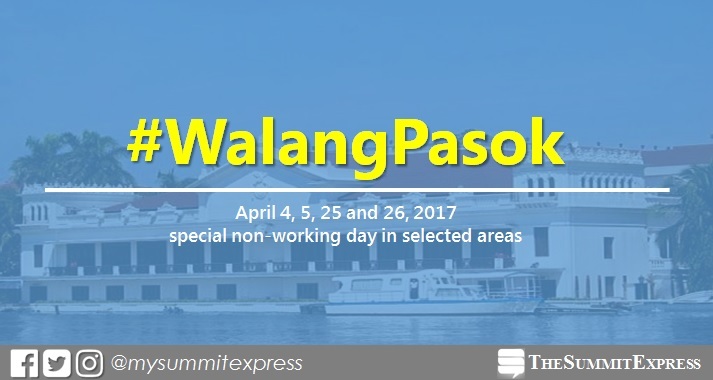 MANILA, Philippines - Malacañang Palace has declared April 4, 5, 25, 26 2017 as special non-working holiday in selected areas for the celebration of important events. Palace officials Menardo I. Guevarra and Salvador C. Medialdea through the authority of President Rodrigo Roa Duterte signed proclamations No. 170, 177, 179, 183 and 184 declaring special non-working day in Himamaylan, Negros Occidental, Antipolo City, Pangasinan province, Isabela City, Basilan and San Jose, Batangas. Proclamation No. 170: Celebration of the "Himaya-an Festival" of the City of Himamaylan, Negros Occidental on April 25 (Tuesday). Proclamation No. 177: Celebration of Antipolo's 19th cityhood anniversary on April 4 (Tuesday). Proclamation No. 179: Celebration of the 437th Foundation Day of the Province of Pangasinan on April 5 (Wednesday). Proclamation No. 183: Celebration of the Charter Anniversary of Isabela City, Basilan on April 25 (Tuesday). Proclamation No. 184: Celebration of 252nd Foundation Anniversary in San Jose, Batangas on April 26 (Wednesday). Meanwhile, Holy Week 2017 regular holidays, Maundy Thursday and Good Friday fall on April 13 and 14, respectively. The next regular holiday will be on Monday, May 1, for Labor Day celebration.